Uranium-238 boasts a radioactive half-life of almost 4.5 billion years. The more uncommon and instable Ur-235 isotope decays half its atoms in a mere 700 million years slightly less eternal. # While it appears epic already, the study and discussion over how to manage such materials promise to endure for decades if not centuries but will clearly never survive the subject matter. Last month, the Department of Energy spit out a new target date for the completion of a national nuclear fuel repository the latest in a cavalcade of projections marching precariously into the distant future. The facility, destined for the volcanic ridge in southern Nevada known as Yucca Mountain, will start accepting fuel by 2017, the agency said, finally providing permanent housing for a growing collection of spent uranium rods. Until then, the debate over how to manage fuel no longer suitable for power generation will surely continue to brew in communities neighboring nuclear facilities. At Diablo Canyon PG&E's 1,200-megawatt facility near Avila Beach rods accumulated since 1986 line a subterranean pool, protected by a bunker set on the bedrock. The company recently installed a new rack to accommodate more rods, but expects the pool to reach capacity by 2010. The makeshift and very-nearly brimming pool storage facility has the power giant as well as many coastal residents on edge. The construction of a bushel of heavily cemented dry-storage casks perched on the hillside will ideally provide a foster solution until the blueprinted repository can accept Diablo's payload. Still, nuclear energy opponents remain up in arms over that development as well. "How much of this waste are we expected to live with, and for how long?" questioned concerned coastal resident Marilyn Brown at a July 25 townhall meeting. PG&E spokesman Jeff Lewis said that the construction effort constitutes a necessary step as a result of continued delays at Yucca Mountain. A burst of outrage at a recent Nuclear Regulatory Commission (NRC) feedback hearing in San Luis Obispo reinforced well-established public opposition to storing the waste in the county. But, the question is: Where else? PG&E and other custodians of nuclear plants across the country maintain that they would rather see the repository accepting fuel sooner than later. The proprietors of Diablo Canyon predicted future litigation would seek to recoup the $100 million for the construction of the temporary dry-cask facility, plus an installation cost of roughly $1 million per assembly. Meanwhile, Nevada governor Kenny Guinn continually stands in the path of federal bodies looking to tote their radioactive luggage into the Silver State. A volley of lawsuits in 2004 delayed construction until 2011 to review evidently flouted emission standards. Then there's the paperwork necessary to truck the material through each and every state and county the fuel will pass through. "There has to be a national will to get something like this accomplished," lamented Richard Hagler, project engineer of Diablo's dry-cask facility. However, if and when a Yucca Mountain facility actually materializes, the repository will take shipments on a rolling schedule meaning it could take decades to clear the nation's on-site storage facilities of their stockpiles. The Department of Energy (DOE) reported that priority would go according to seniority, based on when the federal regulators commissioned the plant. This policy places the relatively young Diablo Canyon far down the list. Hagler estimated it would take another 10 to 15 years after Yucca Mountain's completion in 2017 for the rods to actually leave Point Buchon. As of August 1, DOE officials had not responded with a working schedule for fuel acceptance at the still-theoretical repository. 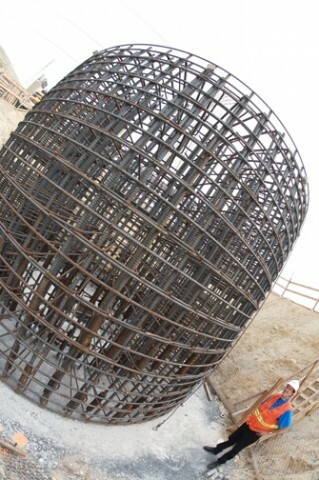 Until the DOE calls Diablo's number whenever that is the spent fuel will occupy the new storage units resting on a thick concrete pad, reinforced by a similar-gauge rebar that webs the containment dome above the reactor. Carried from the pool in transport cases, the fuel rods made up of clusters of ceramic uranium pellets occupy assemblies, which slide into the 180-ton casks for internment. When Yucca Mountain beckons, Hagler said, the installation unit would work in reverse, lifting the assemblies into allegedly fire-, bomb-, gravity-, and collision-proof canisters. Then, off they go to southern Nevada. Naturally, every stage of the plan hinges on litigation. In the short view, NRC officials declined to answer numerous questions regarding the June 2 Ninth Circuit Court's ruling. That judicial body found the agency's analysis of the project lacking a study examining the environmental impact of a terrorist attack. Regulators said they couldn't present the agency's position until after the deadline to officially respond to the court passes on Aug. 31. They also refused to offer specifics of the plant's safety performance in the most recent evaluation, claiming that protecting the information serves the interest of national security a point that may eventually spur future lawsuits by activist groups. "This represents 25 years of secrecy policy," said South County activist Bruce Severance. "We have to break through some of that history." Regional administrator Bruce Mallett asserted that the NRC evaluated the impact of a terrorist attack and that the court's ruling dealt with the agency's failure to include a specific environmental report. PG&E disagreed with the implied injunction on construction of the casks, as a result of the ruling against the agency that issued the permit, and is preparing this month to make another major concrete pour. ?